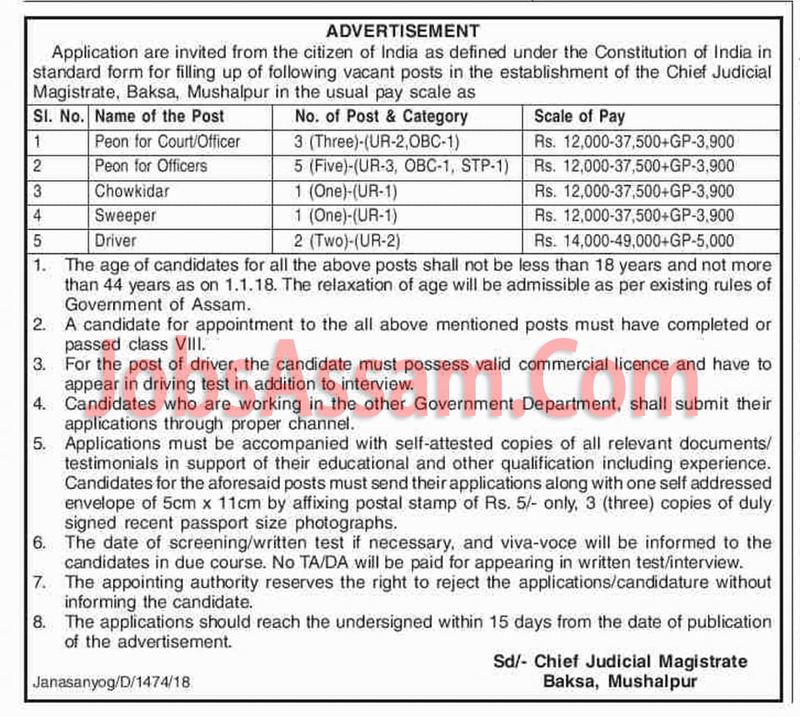 Application are invited from the citizen of India as defined under the Constitution of India in standard form for filling up of following vacant posts in the establishment of the Chief Judicial Magistrate, Baksa, Mushalpur. Age: The age of candidates for all the above posts shall not be less than 18 years and not more than 44 years as on 1.1.18. The relaxation of age will be admissible as per existing rules of Government of Assam. 1. A candidate for appointment to the all above mentioned posts must have completed or passed class VIII. 2. For the post of driver, the candidate must possess valid commercial licence and have to appear in driving test in addition to interview. How to Apply: Applications must be accompanied with self-attested copies of all relevant documents/ testimonials in support of their educational and other qualification including experience. Candidates for the aforesaid posts must send their applications along with one self addressed envelope of 5cm x 11cm by affixing postal stamp of Rs. 5/- only, 3 (three) copies of duly signed recent passport size photographs. Candidates who are working in the other Government Department, shall submit their applications through proper channel. The date of screening/written test if necessary, and viva-voce will be informed to the candidates in due course. No TA/DA will be paid for appearing in written test/interview. The appointing authority reserves the right to reject the applications/candidature without informing the candidate. The applications should reach the undersigned within 15 days from the date of publication of the advertisement.